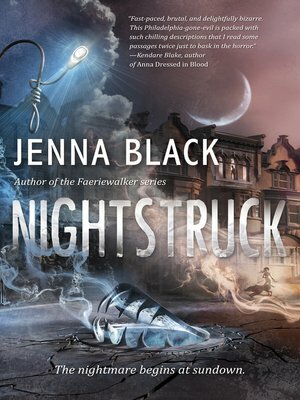 Nightstruck: the start of a spooky yet romantic dark paranormal horror series from Glimmerglass author Jenna Black. Becket is an ordinary teenage girl, wrestling with the upheaval of her parents' divorce. A studious high school senior, her biggest problems to date have been choosing which colleges to apply to, living up to her parents' ambitious expectations for her, and fighting her secret crush on her best friend's boyfriend. But that all changes on the night she tries to save an innocent life and everything goes horribly wrong. Unbeknownst to her, Becket has been tricked into opening a door between worlds, allowing a dark magic into the mortal world. As the magic trickles in, the city begins to change at night. Strange creatures roam the streets, and inanimate objects come to life, all of them bloodthirsty and terrifying. The city returns to normal when the sun rises in the morning, and no one can capture the strange changes—such as potholes turning into toothy mouths and wires turning into strangling vines—on film, which prompts the government to declare that the city has been infected with some kind of madness and must be quarantined. Meanwhile, venturing out of one's house at night has become a dangerous proposition, and the moment the sun sets, most of the citizens of the city shut themselves up in their houses and stay there even in the case of dire emergencies. The magic is openly hostile to most mortals, but there are some individuals it seems to covet, trying to lure them out into the night. While Becket struggles to protect her friends and family from predatory creatures of the night, she is constantly tempted to shrug off all her responsibilities and join them. Joining the night world means being free of not just responsibility, but conscience, and it means no longer caring about the fate of others.